A residential custom wine cellar in Los Angeles, California is one of the many wine storage solutions, and the most ideal of them all. A residential custom wine cellar is not only your wine collection’s house, but also its sanctuary. Therefore, it is important that your wine cellar isn’t just beautiful, but also durable and functional. One of the most important parts of a home wine cellar in Los Angeles, California is the flooring. Wine cellar flooring isn’t just something you step on when you’re inside your storage room. It plays an important role in keeping the temperature and humidity within the cellar at the ideal levels. Wine cellar flooring also contribute to the beauty of your custom wine cellar. 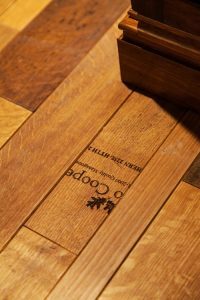 Learn all about custom wine cellar flooring in Los Angeles, California by reading through this page. Wine cellar flooring should be able to withstand the weight of wine bottles in the wine cellar. Wine cellar bottles can be very heavy, and if your flooring is not durable, it can break, and the temperature and humidity in the cellar will be compromised. A lot of wine collectors choose to have their residential wine cellars in California built in the lower levels of their houses (e.g. the basement), because the temperature in these areas is generally cool and constant. If a wine cellar is built in the lower level of a house, the wine cellar floors are usually installed over concrete. Over time, the material used for the flooring may warp due to the humidity inside the wine storage room. To avoid this, it is imperative that, before the wine cellar flooring is laid down, a vapor barrier is installed. Never use carpet for your cellar flooring. It is quite humid inside a residential wine cellar in Los Angeles, CA and if carpet is used for the custom wine cellar flooring, mold can grow over time. Moreover, carpets are hard to clean if you do make spills. There are various materials to choose from for your custom wine cellar flooring in Los Angeles, California. 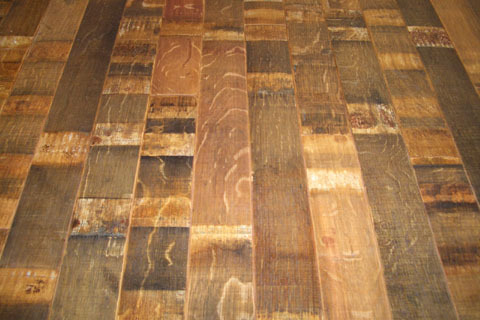 The most common types include wood, mosaic, stone, and reclaimed wine barrels. Each one has beauty to offer. The wine cellar flooring material you choose should match the design of your entire home wine cellar in CA, and should complement the existing décor in your house. It is always best to have your custom wine cellar in CA designed and built by a professional. With a professional, you can be sure that your wine storage room will not only look good, but will also be efficient at keeping your wines safe. Coastal Custom Wine Cellars is one of the best choices for a wine cellar designer in Los Angeles, California. They will take you from the design process up to the completion of your wine storage room. Wine cellars by Coastal are a few of the most beautiful cellars in California. Have your 3D custom wine cellar design made today! 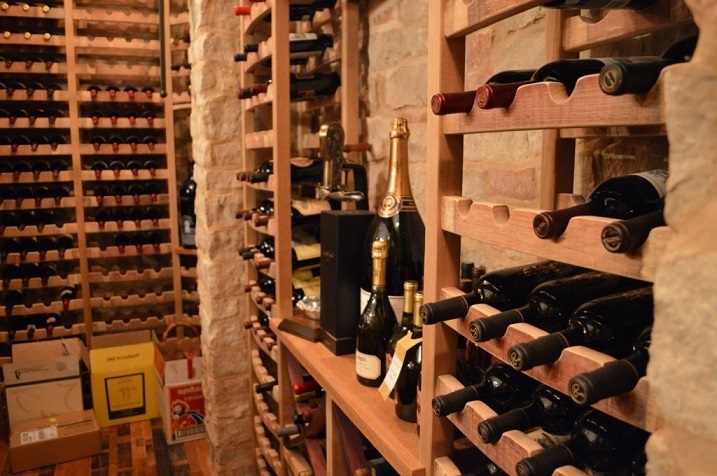 A custom wine cellar in Los Angeles, California is the safest place to store your wine collection. Have a residential wine cellar built by the best wine cellar builders in California. Wine Cellars by Coastal are not only functional and durable, but also elegant and classy. 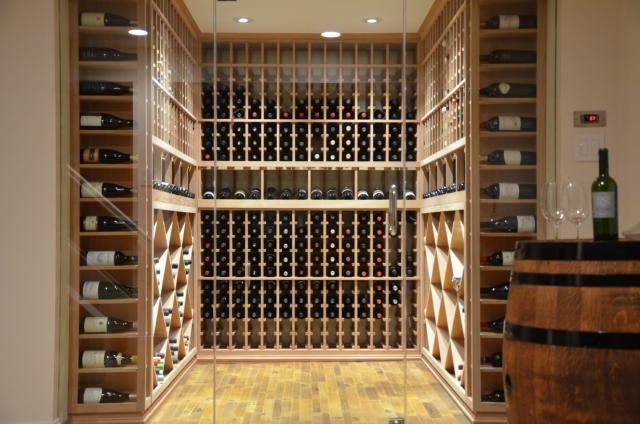 You can make your residential wine cellar in California look even better by customizing it. 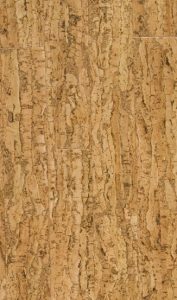 One way you can customize it is by choosing unique wall treatments. 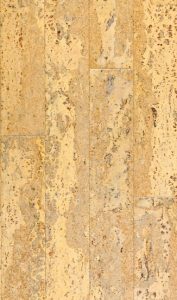 There are various kinds of wall treatments, and these include paint, tile, slate, stone, wood panel and travertine. Whatever treatment you choose, make sure that the material is able to do well in a slightly damp environment. The wine cellar’s flooring plays a very important role in making sure that the wine storage room functions properly. Make sure that the surface of your wine cellar floor is durable and solid. It should be able to withstand harsh flooring conditions, such as constant moisture and frequent wine spills. Wine cellar flooring should also be beautiful. The flooring you choose should complement the overall design of your home wine cellar in Los Angeles. 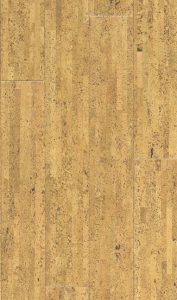 There are many choices for wine cellar flooring, and these include hardwood, sealed concrete, tile and stone. 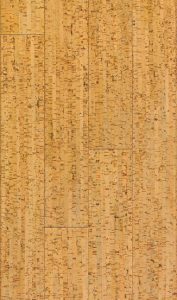 If you do use wood-paneled walls for your custom wine cellar, you need to allow expansion and contraction of the wood. The wood will eventually expand and contract due to the humidity inside the wine cellar. If there is now allowance for expansion and contraction, the wood will eventually crack and buckle. There are a lot of things to consider when designing and building your residential wine cellar in LA, California. For example, you still need to decide on what lighting and other accessories you want installed in your wine storage room. You also need to consider how to avoid vibrations and odors. You need to figure out what wine cellar refrigeration system will you have installed in the cellar as well. 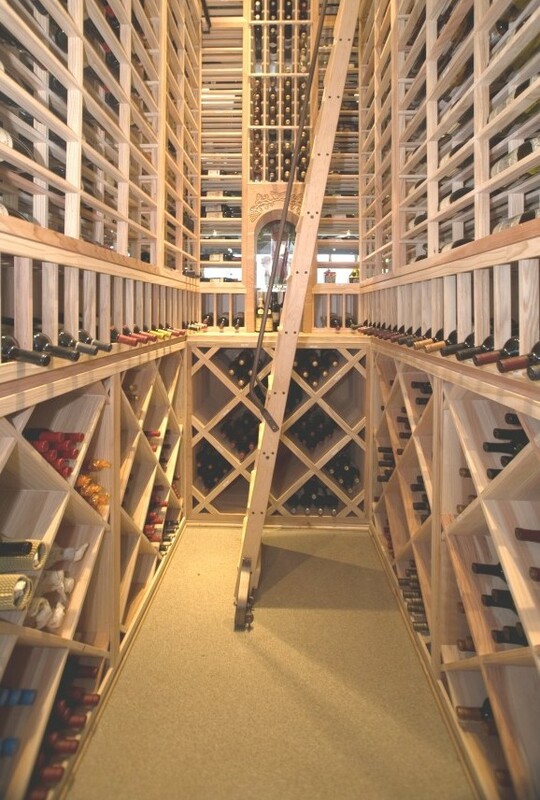 Designing and building a custom wine cellar in LA, California must be planned carefully. 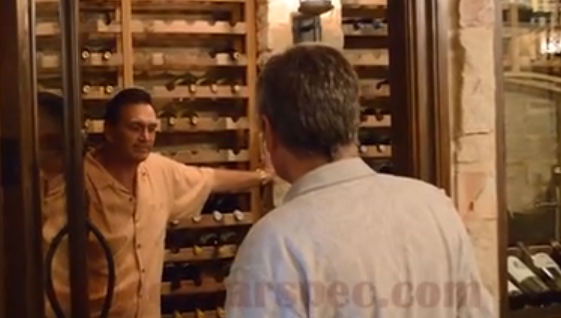 Of course, the wisest way to start is to seek the advice of a wine cellar design professional. The design and construction of a custom wine cellar in Vancouver, Canada should be well thought out, so that it can meet the essential requirements for proper wine storage. The following are the basic parts of a custom wine cellar and how they should ideally be. Wine cellars in Canada should be properly insulated. Wine cellar insulation should be at least R20, so that the temperature and humidity levels are kept from fluctuating. The interior walls of your custom wine cellar should be as inert as possible. Many wine cellar specialists would advise choosing Urethane for your cellar insulation, because it is efficient in sealing the walls and ceiling. Mineral wood is good to use too, but it should be properly protected from humidity, because otherwise it will lose its capacity to insulate after some time. Rigid insulation panels are a good idea as well. To maintain the level of humidity in the wine storage room, a vapor-seal is essential. Make sure that your vapor-seal sheets overlap and are secured with adhesive tapes. The paint used on the walls and ceilings of your wine cellar should be of mold-resistant latex. Bathroom paint is the best option. In order to make room for a wine cellar cooling unit to be installed, avoid cellars that are completely surrounded by concrete. In order to ensure that the temperature and humidity in the wine cellar are stable, an insulated door equipped with weather stripping should be utilized. Cellar doors ought to be at least R16 insulation. Tell your wine cellar designer to have a window or a thermal glass on your door so that you may be able to see your wine collection inside the cellar without needing to open it. Some people opt to have a lock on their wine cellar door, so that they can control access to the wine cellar. This also is a good idea, so that you can control how often the wine cellar is opened. Constant opening of a wine cellar in Vancouver, Canada can cause temperature and humidity fluctuations that are harmful to your wines. 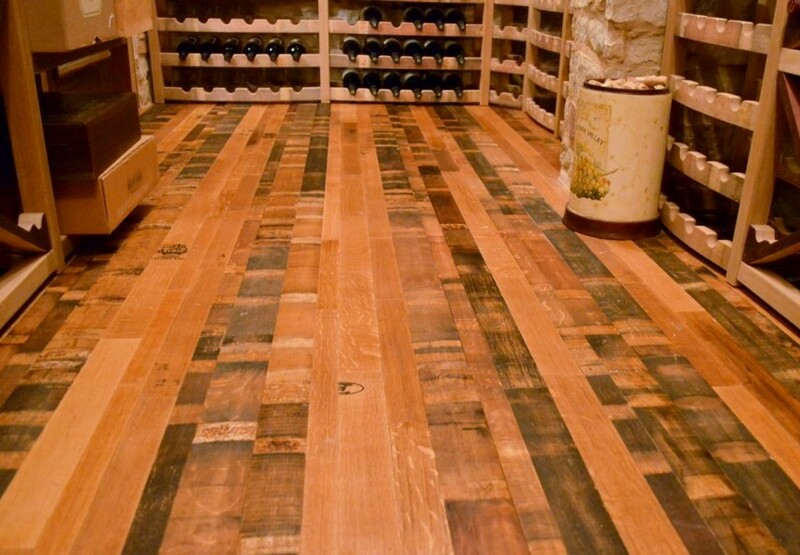 There are various options to choose from when it comes to custom wine cellar flooring. The material you use should be resistant to humidity. Stones, ceramic tiles and marble are humidity resistant materials. 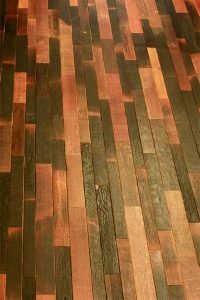 If you want to use wood for cellar flooring, make sure that it is sealed properly, so that it won’t absorb humidity. If you plan to construct your custom wine cellar in your basement, you can make use of the soil’s natural humidity by putting holes through the concrete basement floor. But before that, you have to make sure that the soil is not water logged and that there is enough drainage beneath the basement’s foundation to avoid water infiltration. You may also put holes in the cellar walls to increase the humidity level by 1 to 2 degrees. Don’t forget to cover the holes in order to keep insects out. The lighting you choose for your wine cellar in Vancouver, Canada should be that which generates minimal heat. Heat can damage your wines. The best type of lighting for wine storage rooms is LED. Some wines are not favorable to light. Light dimmers are recommended, so that you can adjust the light as needed. A quality wine cellar refrigeration unit can set the temperature and humidity inside your custom wine cellar to the ideal levels. There are various kinds of wine cellar cooling units. A wine cellar specialist can calculate the heat load in your wine storage room, so that you can identify the appropriate wine cellar refrigeration system for your cellar. Tim: What was your main inspiration for the whole styling and all the woodworking for this custom wine cellars Florida? Jody: Well, we like Italy. We all like the Tuscan days and we rent a castle out in Napa. It was an all stone castle. We saw a room and we liked it. We liked the atmosphere and we thought we’d do something similar to that. Tim: It really comes across that. Jody: It’s like a little dungeon. I call it my little man dungeon. I figured we could fit about 2200 bottles in this custom wine cellars Florida. Tim: You’ve got some really nice features in here, as well. So you just acquire these? Jody: Just about everything we picked out we picked out when we go someplace. We’ve got some French wines that I picked up from France. When we go to Napa we go to the wineries and if we like it we join the wine club and buy different styles of wine. Our latest one is Merlot. Tim: It’s very cool in here, you can feel it. You’ve got a separate area (wine tasting room) where you can sit and enjoy the wine and still feel it because of this whole big glass here. Jody: This is the biggest piece of tempered glass we could find. Tim: Dual paned and tempered? Jody: Yes. We centered the wine cellar cooling unit in the middle so the whole thing can be cool at one end and stays pretty consistent throughout. Tim: I think you’ve done a really tasteful job in here. This wine barrel curvy effect is very unusual. Jody: These are all recycled wine barrels. Everything’s recycled in here. For the green people, I mean, you know, everything is recycled. It’s natural stone off the ground, racking and wine barrel flooring from recycled oak wine barrels. Tim: What really stands out to me is the coloring. They’re not all the same. Jody: Some of these are from red wines and white wines. You’ll see this was from the inside of a red wine barrel. You’ll see the straps. This is from the outside of the barrel. 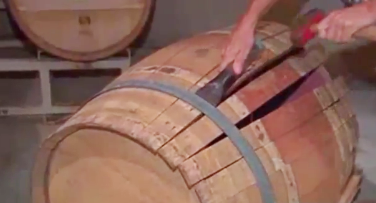 If you look at the inside, they’re a different red because red wine was inside the barrel. Tim: It has a beautifully aged, stylized look. The wine bottles are also stored the other way around which is interesting as well. This wine cellar project is located in Naples, Florida and was designed and constructed by Wine Cellar Specialists. 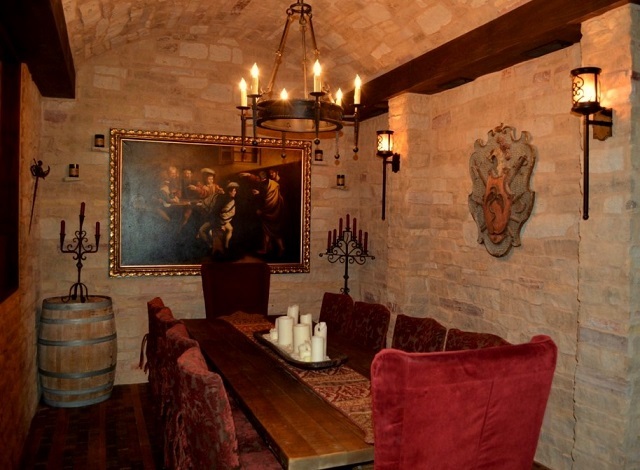 To see more wine cellar projects in Florida and other wine tasting room design features, click on this link – http://pinterest.com/winecellarspec/.